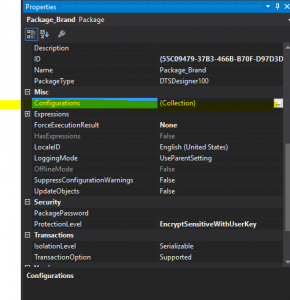 I was working with SSIS package and after using the global parameters, I wanted to create an XML or config file to use with the package. I am using the Visual Studio 2015 and looking for the starting point from this article. 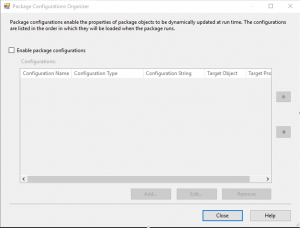 But can’t seem to find the first item “package configuration” option from the context menu. 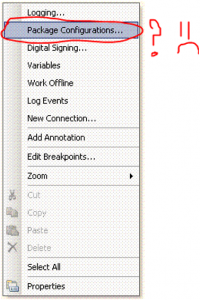 In Visual Studio 2015, you have to look at the properties. Right click on Control Flow Canvas of your Package and select properties. Under “Misc” group select Configuration. And your Configuration window will come up.